One of the things I've found myself creating in the various iterations of the games are Sidepodcars. The original Sidepodcar was a riff off the original look of the website with a nostalgic rush of green and the swooshy blue logo bits too. It was created on Forza 2. 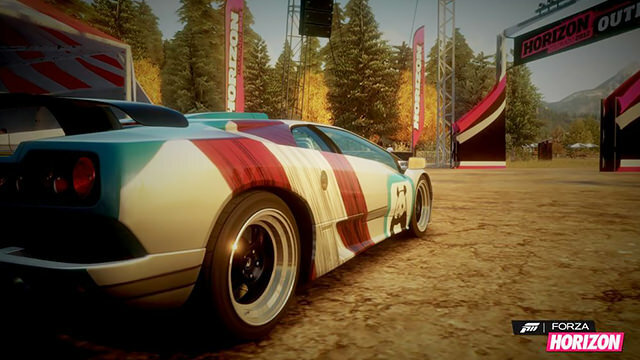 This was the first iteration of both the game on the Xbox 360 and the Sidepodcar, with the follow up Sidepodcar Mk II then being created on Forza 3 a few years later. This one was a little more ambitious as it had a mini replica of how the site looked at the time which I thought was a nice touch. As the website was developing in the wonderful ways it has done so over the years, so were the iterations of the Sidepodcar. 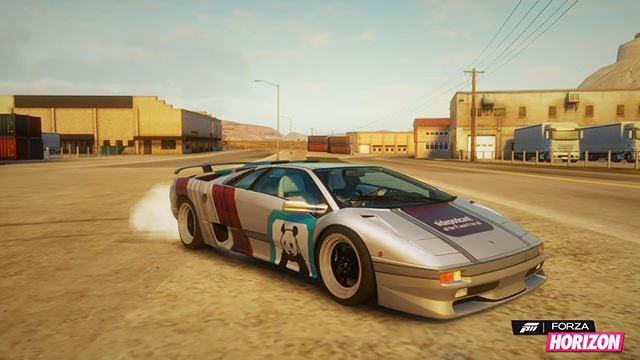 The next Sidepodcar was developed again on Forza 3 with a much more subtle livery and a tribute to our favourite race-accompanying genius that is Christine and her Factbyte Factbox. Of course it was more than overdue for another Sidepodcar and, courtesy of Forza Horizon, we have our next instalment to the Sidepodcar family. The latest design was easily, in my personal opinion, the most ambitious to recreate for a few reasons. The funny thought about Forza is it's always been a huge challenge to create anything relatively worthwhile just for the simple fact you're working with shapes. 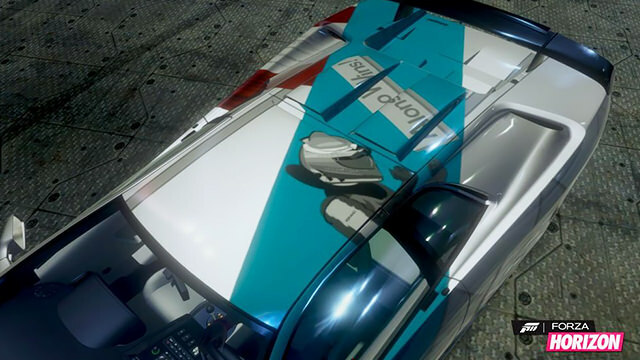 It could be very easy to simply import an image into a game and shape it onto the car chassis to create what you want visually but this has never been something that has come with Forza. Instead the challenge lies with the several hundreds of shapes, numbers and letters (and animals, if you were wondering) and layering them bit by bit over and over to create the desired effect you're looking for. It's a fairly time consuming process but a rewarding one. One of the key components about creating a new Sidepodcar this time round and implementing something different was to try and give something back to the sterling work that Mr C and Christine do with their homepage headers. The homepage is something so easily missable, as has been a continuing theme over the years, yet the headers that sit proudly atop the homepage are always a highlight. It was a risky one as I didn't want to do any discredit to what is often displayed but in the end I went for an old homepage of Fernando Alonso's fist pumping celebration from earlier in the year. Over 200 different shapes later for the Alonso design alone, it came together quite nicely and far better than I was ever expecting. Plus it saw the return of the panda. You can never have enough panda. Mr C asked me a few weeks ago how such things are possible when there's no fundamental photo/image editing side to the game and it's an interesting concept to see if this would ever become reality of a console game like this. Of course there are games such as rFactor on the PC where you can just go ahead and have a much more in depth set of tools to create cars with and have a far better looking car than what I've created but at the same time there's nothing quite like the charm of creating them in this way and putting a fair bit of time into them. It can of course get repetitive cloning a square over and over many times in order to simply create the letter T in a stylised way, as it can honestly get as nitty gritty as that with how little you really have on offer even with the typography, but it all comes as part of the package. It sounds straight forward but you have to remember you're working with two analog sticks, bumpers on top of the control pad and a few buttons instead of a mouse. Again, it adds to the charm working in such a way. You might be wondering what the point of it all is but you'd be surprised how, once you get the hang of creating things on the Forza games, that you want to create something worthwhile. It offers a nice challenge rather than simply having intuitive editing that you'd get on Photoshop if it were for a PC. Over the years I've made a multitude of designs, from Muse cars, the Honda Earth Dreams car, the gorgeous Williams FW33, even a Greggs car at one point, but it's all very gratifying if the end result is worth it. You can see a full album of a little bit of everything right here. It also makes me wonder where we are going next as the next iteration of console gaming introduces itself next month. Forza 5 will be a launch title for the new Xbox One and I'm fascinated to see what it offers with the expanded hardware included in the console for creating stuff like this. I'll be amazed if it stays quite as restrictive as it has done on Microsoft's two consoles so far but at the same time it's also become a tradition to create designs based off many wonderful and weird shapes to utilise the most out of having far too much spare time. So that's a little bit of insight that I wanted to share with the community and offer something that is hopefully as rewarding for you to enjoy as it is for me to create. Creativity is something that can be expressed in a whole magnitude of wonderful ways and this is something that, with a bit of patience and time, can lead to pretty fun things. Plus we end up with our own Sidepodcars which is always nice to have really as they might be a bit more expensive in reality. Of course, I can't say the cars look too impressive once I've spent time on a track with them due to my ability to treat every serious racing game as Mario Kart. All we need now are some blue shells.